With lower loan rates, higher savings rates, more personal service and fewer service fees, credit unions are a viable, and growing, alternative to traditional banking. Rather than make a profit, credit unions give their profits back to their members. Given these features, credit union lending and participation is on the rise. 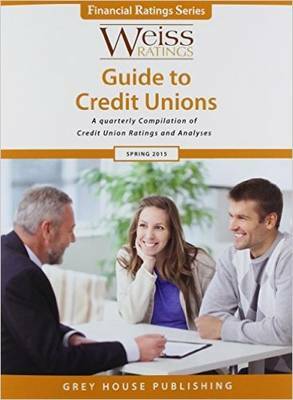 This new reference tool provides accurate financial strength ratings of the 7,800 credit unions in the US. Weiss's rating scale is extremely straightforward and easy to understand. There are no complicated number grades to interpret, no colored paper to decode, and no stars to count. Instead, each entry gets a simple, intuitive letter grade that immediately identifies the wheat from the chaff. This is one more reason why Weiss Ratings is widely recognized as ""America's Consumer Advocate for Financial Safety."" The Weiss Safety Ratings have been proven to be the most accurate available from any of the major rating agencies. Plus, unlike the other major rating agencies, Weiss does not accept compensation from the companies it rates, and thus does not allow companies to influence the ratings they receive or to suppress the release of their ratings. In fact, the U.S. General Accounting Office (GAO) validated Weiss' accuracy in its Insurance Ratings study, and that same superior rating methodology is used when deriving all other ratings as well.